In modern society the best holiday gift and count the money. 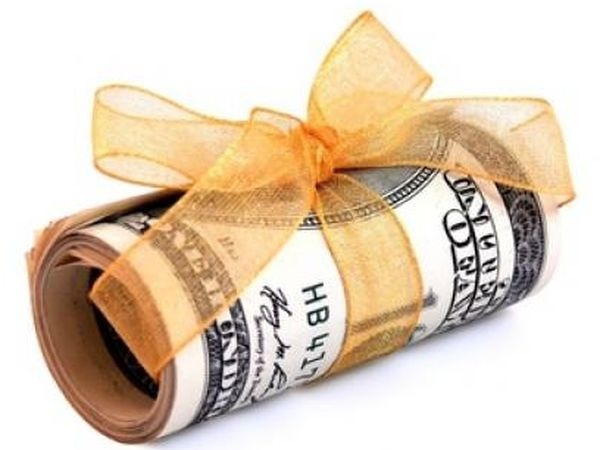 But to present the bills in the envelope is becoming less popular way to bring happiness to bestow, because there are many options to donate money original. - packing depending on the method. Purchase a photo frame and place beautiful bills under the glass. A picture of the birthday boy can hang on the wall, leaving a gift for the future, and can spend money and use their packaging for the purpose. Everyone would like to become the owner of the money bag. To give money original, package the banknotes in a beautiful pouch with drawstring. There you can put coins, exchanging the amount of the gift shop. The heavy bag is sure to please bestow your rights. Pour a decent amount you can also change in a piggy Bank, a basket, a jar. To give money in the Bank – at least an interesting idea. Packing her notes, close the lid with the sealing machines adorn the label with the greeting and ribbon. For the manufacture of precious cake you need toy money, while the amount of a better gift to exchange. To get a cake big size, use the optional toy money. Twist fakes a tube, wrap with real money, give them a little deal, fix the edges with staples. Part of the resulting tubes make the bottom tier of the cake by posting the details of the fasteners inside, and tie with ribbon. The same repeat with the remaining money. Nice to give money, turning them from flowers or erecting the leaves of trees. These origami can be done not only bulky, placing them in a pot or in a vase, but make them a picture or applique. Decorate a bouquet or tree is possible money butterflies. To do this, cut them out of construction paper in the body of the butterfly, make two cross cuts and pull them rolled into a tube of bills. By the way, the hack of money you can make any shape, if you remember, as a child of paper you've done planes, boats and frogs. Yes, and thematic applications of banknotes and coins, placed on double-sided tape, the birthday boy will delight in its value and originality. Original give money in a balloon. For this deflated ball rolled gently push the narrow tube of the bills, and then fill it with helium. Decorate a gift, filling the balloon with glitter and colorful ribbons. Money can be hidden in a book, in fact it is the best gift for the well-known statement. Cut out the recess for the money in it yourself or use the services of shops already picked up this idea and get there ready packaging. Original way to give money not only Packed them somewhere, but making them with packing material. Take a small box, put into it a little surprise, for example, the candy, and gently wrap the bills, secure the wrap with a bright ribbon. Twisted money can be placed in a tube of lipstick, pack of cigarettes, pen, bottle. Original way to give money, investing them instead of photos in album roll up in a tin can, folded in a suitcase, making them the carpet. These unusual gifts will definitely cheer the traitor and his guests.